"Get your fur baby ready for a very Merry Christmas with this 3/8"" collar. 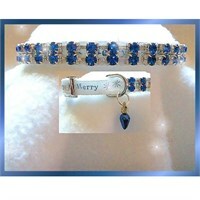 This white nylon collar has satin ribbon sewn on and gorgeous sapphire crystal rhinestones. Included is the cute Christmas light charm!"